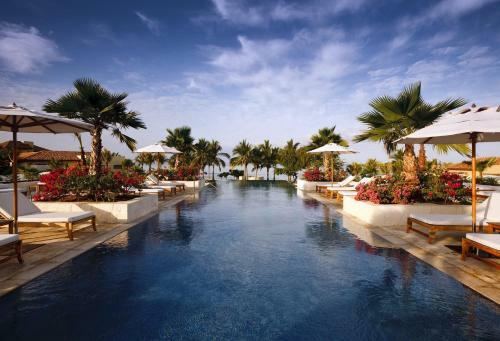 With a stunning beach, three outdoor pools and a number of decorative aquatic features, water is the star at the luxurious St. Regis Punta Mita Resort on Mexico's Pacific Coast. The multiple low-rise buildings have a hacienda-like feel, with stucco exteriors and wood beam accents, at the St. Regis. 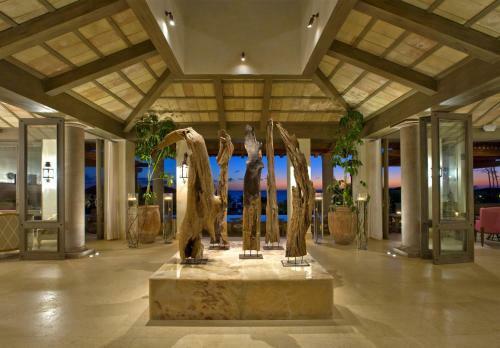 Guests step into the open-air lobby with views straight through to the gorgeous ocean. Lush garden paths lead to 120 non-smoking rooms that exude relaxed luxury, with private terraces, outdoor showers and clay tile floors. Some of the property's many perks include free Wi-Fi, iPod docks, 37-inch flat-panel TVs and minibars. Spacious stone bathrooms supply plush robes and slippers, as well as high-end toiletries and soaking tubs. 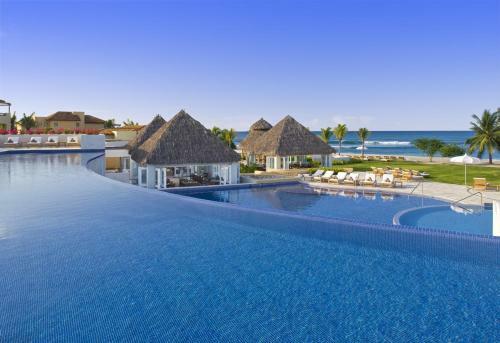 In addition to 24-hour room service, dining options include fine Mexican food at the hotel's signature restaurant, three casual spots, a beach-side bistro and small bites alongside the adult pool. Two other outdoor pools allow guests to beat the heat, and there's also a kids' club, scuba diving and bicycle tours. Satisfy curiosity by enrolling in Spanish, cooking or dancing classes. Guests can book tennis courts or tee times at nearby facilities. After a day of playing hard, unwind with a treatment in the resort's sprawling spa. Parking is free, babysitting, concierge and butler services are offered. Pets are allowed for a fee. The St. Regis sits on 22 acres, including plenty of beachfront on the Pacific Ocean. The small town of Punta de Mita is a two-mile drive and has local eateries and shops. Within a few miles, guests can explore El Anclote Beach. Tours out to the Marietas Islands, turtles hatching at Nuevo Vallarta Beach and animal fun at Dolphin Discovery Vallarta are each within an hour of the resort. The closest major airport is Licenciado Gustavo Díaz Ordaz International Airport, a 26-mile drive. our guests agree that incredible service, a peaceful location and delicious gourmet food make the St. Regis a perfect retreat in Punta Mita. 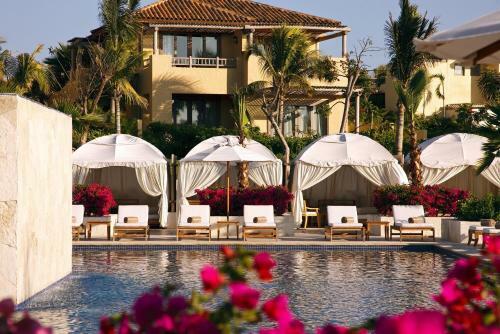 The St Regis Punta Mita Resort is an amazing Bahia De Banderas lodging choice for your trip to Mexico. With numerous amenities for guests such as restaurant, hair dryer, alarm clock, you will wake up at The St Regis Punta Mita Resort feeling refreshed every day for your time in Bahia De Banderas. Don’t let this amazing reservation opportunity pass you by, book your stay at The St Regis Punta Mita Resort today to make the most of your time in Bahia De Banderas, Mexico.